When my friend Tamara (same name as me and we are both Puerto Rican!) told me she was pregnant with Daniel Jose I was so excited! First time taking pictures of a newborn for a friend! She told me his nursery theme was airplanes and I fell in love! Most people that have known me for a while know that Aviation is a passion of mine. After she told me I immediately called one of my favorite vendors, Lolo & Max to design an upcycled aviatior hat for me! Christie took the challenge (I kinda made her ;) ) and it turned out to be even cuter than I imagined! When you book a session with me, I take the time to know what your expectations are and we start planning the session when we meet for your consultation. I encourage all my clients to take this opportunity to also meet me and get to know what the whole Lullabies for Josephine experience is all about. I am so happy how this gallery turned out! One of my favorite photos is the one with the bunny hat! It's just the cutest! 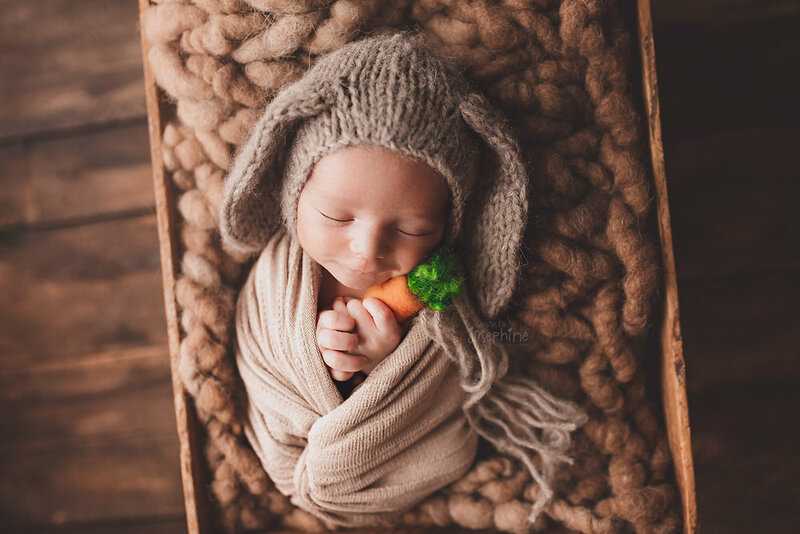 Hat and carrot was made by another of my favorite vendors Baby Boies. Danielle is one of the nicest people I know! Her items are made with high quality materials and very well made. I take the time to know the vendors I work with to ensure that nothing that I put on your baby will be harmful to his/her skin. I have a huge variety of props here at the studio. While I ask my clients if they want to bring something for their session, I always let them know that they dont even need to stress about that part of the session either! I just want you to come to the studio for your session, relax and enjoy the few hours you have free!